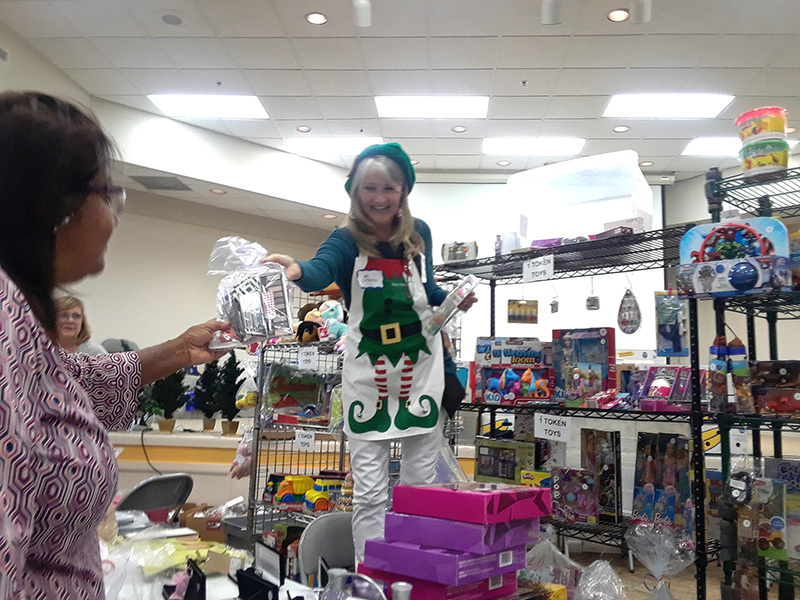 Jeanne Madden helps parents pick out presents for their children at Good Samaritan Mission’s Christmas Blessings event Dec. 9 at SouthShore United Church of Christ. Hundreds of children found a present under their tree Christmas morning thanks to Good Samaritan Mission and the generosity of the South Shore community. Christmas Blessings drew more than 100 parents, many migrant farm workers, to the Wimauma-based charity to cash in chips they had earned throughout the year taking classes at the Mission. Local churches and individuals donated the gifts. “Half of the parents can’t afford to buy presents because of Hurricane Irma so this gives them an opportunity to do that. Without (Christmas Blessings) many children would not get a present,” said Cristin Calvill who has been coming to the Mission for more than 30 years. Good Samaritan emphasizes self-help, offering classes throughout the year in everything from basic healthcare to fire safety where students earn tokens for each class they take. Those tokens can be redeemed for food at the Mission’s food bank throughout the year, although no one is ever turned away if they need food. Many parents also bank their tokens for Christmas Blessings, buying gifts for children who might otherwise have nothing to unwrap on Dec. 25. Spent on a bag of rice or a doll, the point is families earn their tokens, said Theresa. who runs the Mission with her husband, Bill Jr.
“[Christmas Blessings] shows children that their parents have been coming to classes, continuing their education and if mom and dad can do it, I can do it,” said Theresa Cruz who also directs the Mission’s Seeds of Change educational self-help program. Bill Cruz’s parents, Pastor William and Dora Cruz, founded the Good Samaritan Mission in 1984. A licensed family and marriage therapist with a degree from the University of South Florida and an ordained minister, Cruz Jr. took over at Good Samaritan in 2008. 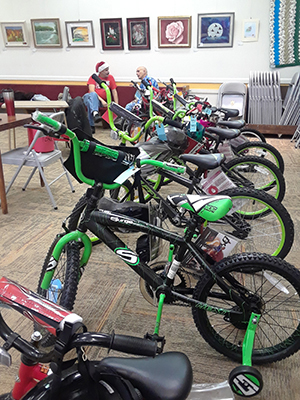 From soccer balls to bikes, there was plenty for parents to pick from at the Dec. 8 event. Jennifer Daly oversees Christmas Blessings, starting in November organizing one of the Mission’s biggest events. Wayne Williams, who retired from Grace United Methodist Church in Lithia, drove all the way from Ocala to attend the event he calls one of the best he’s seen in more than 30 years in ministry. The new year will bring more classes and a new mobile outreach plan at the Mission. The 10.5-acre plot on Balm Wimauma Road, three buildings, a large kitchen, offices, playground and storage sheds with 32,935 square feet of air-conditioned space – is on the market for $1.2 million.